With a little science that seems like magic, I'm going to show how your perception of a piece of music can change dramatically on a second listen. But first, take a look at the blobs in the image at the top of this post. What do you see? 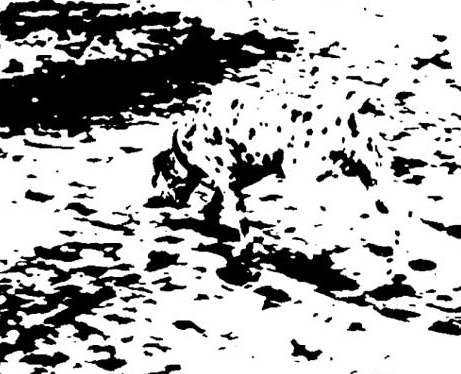 Now, if I tell you it's a picture of a Dalmatian, your brain instantly latches on to the idea. You'll never be able to unsee this dog. Cool, huh? Just like the Dalmatian picture, once we know what to listen for, our brains can easily pick out this melody even when its notes are randomly scrambled into three octaves. This "mysterious melody" illusion was discovered by psychologist Diana Deutsch, the world's leading discoverer of musical illusions. I spoke with Deutsch about this illusion, and she pointed out four interesting things that it teaches us. 12-tone pioneer Arnold Schoenberg threw out the idea of octaves in his theory, assuming listeners would interpret a tone row basically the same way no matter what kind of octave-leaping happens. In one sense he was wrong, because as Deutsch's illusion demonstrates, even such a memorable melody like "Yankee Doodle" can be hidden in different octaves. In a way, the "Yankee Doodle" illusion explains why our brains appreciate the development section of a Beethoven sonata, or the improvised solo in a John Coltrane performance. Once we know the theme, composers can throw variations at us and we can still recognize the original melody, even though it's cast in a different light. Modern composers and music producers have wonderful tools to listen back to their music instantly and repeatedly — but they need to remember that first-time listeners and performers may perceive their music totally differently. What sounds like a wonderful melody to the composer could seem like random chaos to the listener. As ego-bruising as it might be, all music creators should take listener feedback to heart. If a piece of music seems unapproachable the first time you listen, remember that your brain is ready and waiting to make more connections the second time around. Is there a piece of music that inspired a major change of heart after you gave it a second listen? Share it in a comment below! On January 1, 2013, Charlie McCarron gave up most sensible sources of income to tempt fate as a freelance composer. To help shed light on the creative process of writing music, he started the weekly interview podcast Composer Quest.